PechaKucha NYC at A/D/O: "Common Sense"
Join us for our biggest annual PechaKucha Night at the recently opened A/D/O space in Greenpoint for an evening championing COMMON SENSE and in collaboration with the Design Academy at A/D/O and NYCxDESIGN, New York City’s official citywide celebration of design. PechaKucha ペチャクチャ, or “chit chat” in Japanese, is a concise presentation style, comprised of twenty slides at a duration of twenty seconds each that advance automatically. PK Nights invite creatives of all fields to meet, present projects, and exchange ideas in this 20 x 20 format in 1000 cities around the world. 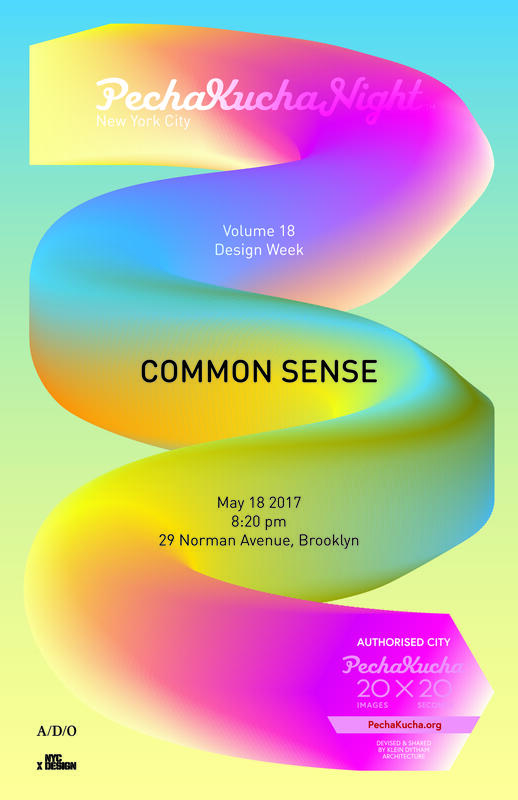 Our May 18 event invites leading architects, designers, engineers, scientists, teachers and more to speak about common sense - whether learning valuable lessons, investigating new technologies, or totally failing - with a very social beer break or two. Topics are always a surprise until night of - you'll have to join us for what will be a great and unexpected evening of storytelling. Doors open at 8pm, event begins at 8:20pm.